As the Church grew rapidly in 1830–1831, it did not take long for the early brethren to recognize a need to print the many revelations Joseph Smith was receiving. At a conference held on November 1, 1831, the decision was made to print the Book of Commandments, a precursor to the Doctrine and Covenants. At the same conference, some felt the language used in the revelations was not worthy of the voice of God. In the revealed preface to the book, now Doctrine and Covenants 1, the Lord responded, “these commandments are of me, and were given unto my servants in their weakness, after the manner of their language, that they might come to understanding” (v. 24). The Book of Mormon itself provides examples that illustrate how God adapts the way He communicates to the understanding of His servants. Many scholars have commented on how “Lehi’s prophetic calling fits within the historical context of preexilic Israel.” Key elements to this pattern include seeing God upon His throne, seeing the heavenly hosts, receiving a heavenly book, and being called to deliver the message of the book to the people (see 1 Nephi 1:8–14). To ancient Israelite prophets, revelation came in ways consistent with “a shared cultural language among neighboring ancient Near Eastern cultures.” Early Book of Mormon prophets shared in this cultural language, and received similar visions. As Book of Mormon peoples adapted to their New World environment, the Lord adapted His manner of communication to their new cultural understanding. When the Lord called a prophet again in the 19th century, He once again spoke to him “in [his] weakness, after the manner of [his] language, that [he] might come to understanding” (Doctrine and Covenants 1:24). This does not just apply to the sometimes rough and ungrammatical language in the early revelations came in. 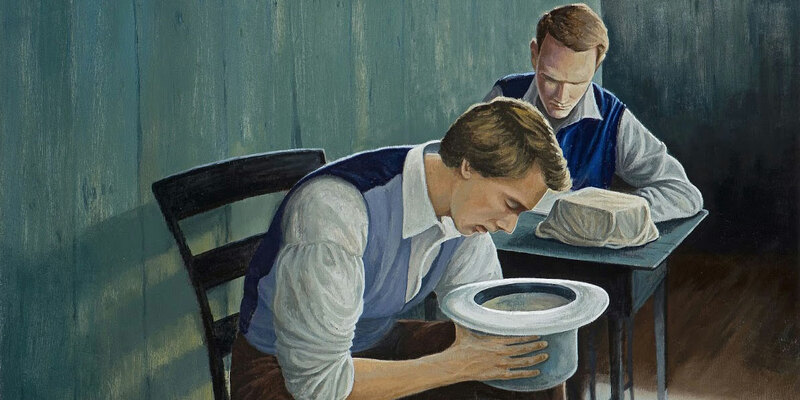 It shaped everything about how God communicated with Joseph Smith, from the kind of visions he had, to his use of a seer stone, to the theological vocabulary in his revelations. Modern Latter-day Saints believe in continuing revelation, collectively and individually, and cultural context continues to influence the manner in which divine manifestations are received by individuals entrenched within the various cultures that comprise the worldwide church. See Richard E. Turley Jr. and William W. Slaughter, How We Got the Doctrine and Covenants (Salt Lake City, UT: Deseret Book, 2012), 15; Steven C. Harper, Making Sense of the Doctrine and Covenants: A Guided Tour through Modern Revelation (Salt Lake City, UT: Deseret Book, 2008), 1, 18. Harper, Making Sense, 233. Doctrine and Covenants 67 was revealed as a direct challenge to those questioning the language of the revelations. “Behold, this is mine authority, and the authority of my servants, and my preface unto the book of my commandments, which I have given them to publish unto you, O inhabitants of the earth” (Doctrine and Covenants 1:6, emphasis added). A committee was originally appointed to write a preface to the book, but it was not to the satisfaction of all the brethren, and they petitioned Joseph Smith to ask the Lord. See Harper, Making Sense, 2, 18; Matthew C. Godfrey, “William McLellin’s Five Questions,” Revelation in Context, January 3, 2013, online at history.lds.org, identifies the committee as William McLellin, Oliver Cowdery, and Sidney Rigdon. Mark Alan Wright, “‘According to Their Language, unto Their Understanding’: The Cultural Context of Hierophanies and Theophanies in Latter-day Saint Canon,” Studies in the Bible and Antiquity 3 (2011): 52. Wright, “According to Their Language,” 59. See Blake Thomas Ostler, “The Throne-Theophany and Prophetic Commission in 1 Nephi: A Form-Critical Analysis,” BYU Studies 26, no. 4 (1986): 67–95; John W. Welch, “The Calling of a Prophet,” in First Nephi, The Doctrinal Foundation, ed. Monte S. Nyman and Charles D. Tate Jr., Book of Mormon Symposium Series, Volume 2 (Provo, UT: Religious Studies Center, Brigham Young University, 1988), 35–54; Stephen D. Ricks, “Heavenly Visions and Prophetic Calls in Isaiah 6 (2 Nephi 16), the Book of Mormon, and the Revelation of John,” in Isaiah in the Book of Mormon, ed. Donald W. Parry and John W. Welch (Provo, UT: FARMS, 1998), 171–190; John W. Welch, “The Calling of Lehi as a Prophet in the World of Jerusalem,” in Glimpses of Lehi’s Jerusalem, ed. John W. Welch, David Rolph Seely, and Jo Ann H. Seely (Provo: FARMS, 2004), 421–448; David E. Bokovoy, “On Christ and Covenants: An LDS Reading of Isaiah’s Prophetic Call,” Studies in the Bible and Antiquity 3 (2011): 36–42; Book of Mormon Central, “How Did God Call His Prophets in Ancient Times? (1 Nephi 15:8),” KnoWhy 17 (Janaury 22, 2016). See Stephen O. Smoot, “The Divine Council in the Hebrew Bible and the Book of Mormon,” Studia Antiqua: A Student Journal for the Study of the Ancient World 12, no. 2 (2013): 1–18. Mark Alan Wright, “Nephite Daykeepers: Ritual Specialists in Mesoamerica and the Book of Mormon,” in Ancient Temple Worship: Proceedings of the Expound Symposium, 14 May 2011, ed. Matthew B. Brown, Jeffrey M. Bradshaw, Stephen D. Ricks, John S. Thompson (Salt Lake City and Orem, UT: Eborn Books and Interpreter Foundation, 2014), 248. See also Wright, “According to Their Language,” 59–60. Wright, “According to Their Language,” 60; Wright, “Nephite Daykeepers,” 249. Wright, “According to Their Language,” 60–64; Wright, “Nephite Daykeepers,” 247–252. Wright, “According to Their Language,” 51. For discussion of some of Joseph Smith’s experiences in a 19th century context, see Richard L. Bushman, “The Visionary World of Joseph Smith,” BYU Studies 37, no. 1 (1997–98): 183–204; Mark Ashurst-McGee, “Moroni as Angel and as Treasure Guardian,” FARMS Review 18, no. 1 (2006): 34–100; Brant A. Gardner, The Gift and Power: Translating the Book of Mormon (Salt Lake City, UT: Greg Kofford Books, 2011). Spencer W. Kimball, Munich Germany Area Conference, 1973, 77; as cited in Daniel C. Peterson, “The Small Voice,” Interpreter: A Journal of Mormon Scripture 22 (2016): x.
 Wright, “According to Their Language,” 65.